Mini White pumpkins are small in size, averaging 5-8 centimeters in diameter and weighing ½-1 pound, and are round, squat, and flat in shape. The smooth rind is deeply ribbed connecting to a thin, light brown stem, and the rind can range in color from bright white to a creamy off-white hue. The firm and dense flesh also ranges in color from bright orange to white and encases a central cavity filled with stringy pulp and many flat, cream-colored seeds. When cooked, Mini White pumpkins are tender and sweet with nutty flavors reminiscent of acorn squash. Mini White pumpkins are available in the fall through winter. Mini White pumpkins, botanically classified as Cucurbita pepo, grow on small creeping vines that can reach up to three meters in length and are members of the Cucurbitaceae family along with squash and gourds. Mini White pumpkins are not pumpkins and are actually classified as gourds, but because of their similar appearance, they are sold as pumpkins for marketing purposes. There are many different hybrid varieties of Mini White pumpkins including Baby Boo, White Gooligan, and Casperita, and these petite fruits are mainly used as ornamentals during the fall season. Some miniature white varieties can also be consumed and are used in a wide array of culinary applications. Mini White pumpkins contain some beta-carotene, potassium, fiber, vitamin E, and iron. Mini White pumpkins are predominately used for ornamental purposes, but some varieties are edible and are best suited for cooked applications such as roasting, steaming, and baking. Mini White pumpkins are commonly used as a serving bowl for savory dishes such as cheese sauces, dips, soups, curries, and stews. They can also be stuffed with meats, rice, and fall vegetables. In addition to savory dishes, Mini White pumpkins can be used as a ramekin for custards, pumpkin pie, crème brulee, apple crisp, or pumpkin cheesecake. Mini pumpkins pair well with maple syrup, black beans, quinoa, couscous, Brussel sprouts, cauliflower, mushrooms, garlic, red onion, green onion, currants, pine nuts, pecans, walnuts, cinnamon, sage, and thyme. They will keep for 6-12 months when stored in a cool and dry place. 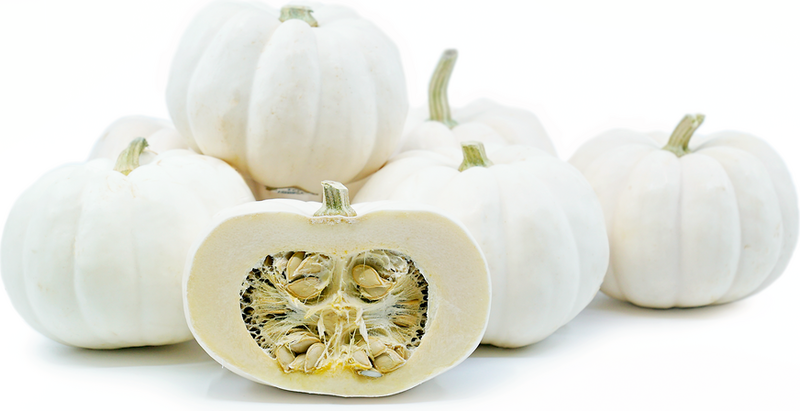 Mini White pumpkins are a popular home garden gourd because of their small size. The vines only grow to one meter in height and can grow well on trellises and along fences. Home gardeners favor Mini White pumpkins for their resistance to disease, high yields, unusual color, and small size. Mini White pumpkins are often used as fall table decorations along with mini Indian corn and colorful gourds and in do it yourself projects such as painting the pumpkins, hollowing them out to make candle holders, or using them as serving bowls for soups and fall dishes. Pumpkins are native to Central America and were spread across the globe via explorers and trade routes. The exact origins of the Mini White pumpkin are unknown, but varieties like the Baby Boo were developed by John Jaunsem in West Milton, Pennsylvania in the 1990s. Today Mini White pumpkins can be found at farmers markets and specialty grocers in North America, Europe, Asia, Australia, and Central America. Someone shared Mini White Pumpkins using the Specialty Produce app for iPhone and Android.